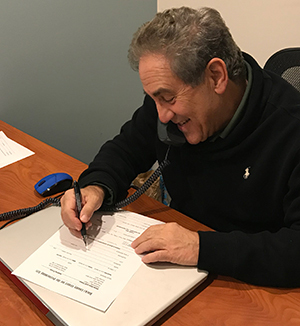 Pictured here is a clearly happy Howard Perloff, Artistic Director of the Bucks County Center of the Performing Arts, during the opening days of 2018 season ticket sales in the group’s Doylestown office. Tickets went on sale for the shows in the 2018 season on November 25th, and have already been brisk. In the first three days of sales, the group sold over 200 tickets, an excellent start for the new season. The group is staging three shows in 2018, with performances from June 27 to August 18, 2018: The Fantasticks, Defending the Caveman, and A Chorus Line. All performances are held in the Life Sciences Building Auditorium on the campus of the Delaware Valley University in Doylestown. Ticket prices begin at $37, and it is possible to buy tickets for all three shows in a package for $99. Bucks County Center for the Performing Arts is a 501(c)(3) non-profit organization. Donations are appreciated!